OMG Posters! » Archive New Jeremy Fish Art Prints - OMG Posters! I have no idea how old these are, but they sure are cool. 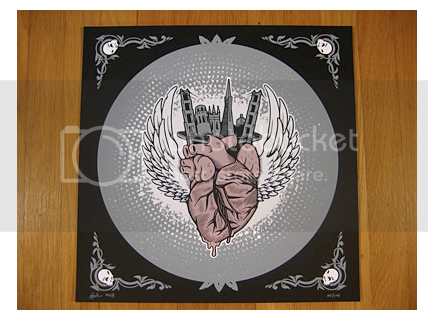 Both “Heart Hunters” and “Home Is In The Heart Of It” are 15″ x 15″ screenprints, have editions of 100, and are $50 each. Jeremy Fish prints are pretty hard to find, so these are a decent pickup. Visit UmbrellaMarket.com. Totally new artist to me. Heart Hunter is awesome. Thank you my favorite blog ever. Jeremy Fish is totally new to you? Put “jeremy fish” in the search box of this site and watch the Aesop Rock video I posted. Great video and song. Loved it. I’m really into hearts and owls so this was an easy buy for me. And anything small I can frame and put in my cubicle at work is also a bonus. Yeah, I didn’t know Fish before. I came to this blog around May of this year? Always learning more. Do yourselves a favor and pick up the new J. Fish book by UPPER PLAYGROUND. It is really well done. Best art book I have purchased in awhile. 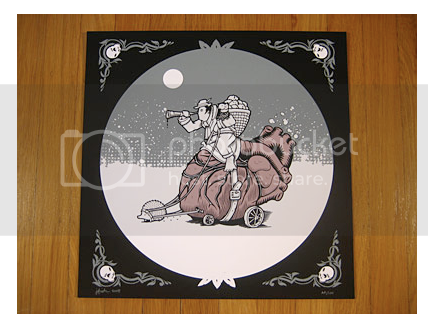 I don’t even know how I got to your site but that’s how I found out about these Jeremy Fish prints, so thanks for the heads up! I love his work. Hey there – Rick from umbrella told me that there are now new prints up. Just a head’s up – it’s a set. I didn’t know to email the admin so I’m posting here. does anyone know if these are still around? or have any idea where I can get this? i just want the “Home is in the Heart of it” one, it’s so sick and my boyfriend will probably cry if I get it for him. ANY help is much appreciated, I’ve been looking everywhere.